Beadwork is one of the oldest and most global artforms. Considered the most enduring style of self-beautification, people have been adorning themselves with beads since prehistoric times. Today's beadwork is considered an exciting genre of art: many people are rediscovering the unlimited possibilities when it comes to beads. The author of this series, Wendy Simpson Conner, is a third-generation bead artist: her grandmother designed beaded gowns and jewelry for Anna Held, wife of Flo Ziegfeld, and the Ziegfeld Follies. Both beginning enthusiasts and accomplished bead artists will delight in this series of books. They are rich with thousands of illustrations and photographs, and very comprehensive sections with step-by-step instructions for hundreds of projects. The Best Little Beading Book is considered by many to be the beading bible. With 276 pages, its picture glossaries depict the dynamics of bead shapes and sizes, pliers, needles, stringing media, and more. 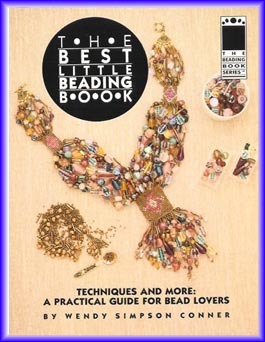 The many chapters include: how to design and construct jewelry (pearl knotting, wirebending, Chinese knotting, earrings, and more); how to make your own beads with polymer clay, fused glass, etc. ; healing with gemstones (chakras); esoteric values of color, shapes, and other symbolism; how to start a small jewelry making how to create a portfolio; and lots more! The author's writing style is very easy to understand, and the step-by-step diagrams and many photographs make these books easy to get hooked on. The photographs are beautiful, full-color celebrations of fabulous beaded art that the reader can very easily make. This series is very inspirational, and considered the most popular beading books on the market today! Amust-have for beginners and pros!